But being a fan of black coffee, it was time to face my fear. A kindly contact recommended Q Clinic on Harley Street, London, for its luxurious interior, zen-like reception and speedy treatments. They weren’t wrong – arriving breathless and flustered from the tube I was instantly put at ease by the welcoming staff and plush facilities. Rather than sit biting my nails, as I waited for my appointment I watched BBC News on the huge plasma TV and completely forgot where I was. So far, so calm. The clinic also comes highly recommended by Tatler – their ‘250 best private doctors’ was helpfully left in the magazine rack – and TV’s 10 Years Younger. Soon, it was showtime. Chief executive Dr Tapesh Anand and his assistant welcomed me into a cheery, inviting room and instantly put me at ease by talking me through each step of the mercifully brief treatment. Next, it was time to agree a shade of white. Dr Anand used a colour chart (akin to a Dulux chart) to find my current teeth shade and recommend an improvement. No Tom Cruise whiter-than-white shades here – the hue was definitely white but a healthy, natural tone. 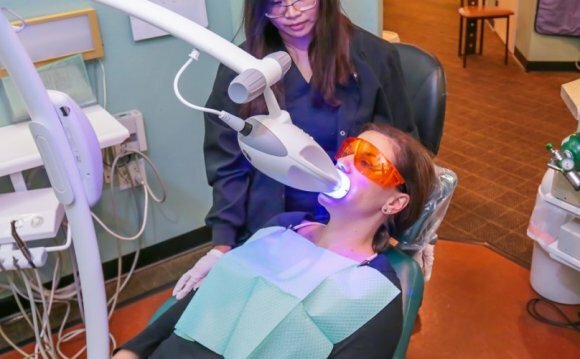 Donning a bib, shades and a retractor device to hold tongue, lips and cheeks out of the way, Dr Anand then applied the whitening gel quickly to the top row of my teeth. An activator light was then turned on for a 15-minute blast. Despite the elaborate contraption in my mouth, I felt very comfortable and even fell asleep. When the 15 minutes was up, Dr Anand quickly removed the gel then applied another batch to the bottom row of my teeth. Another 15 minutes under the light and, though I felt a pang or two (like mild toothache), again I was by no means uncomfortable. Finally the moment of truth – and, though there was no mirror and applauding group of friends and family (as seen in those emotional makeover programmes), it was a pretty epic moment. Twenty eight years of enamel discolouration removed in just 30 minutes.